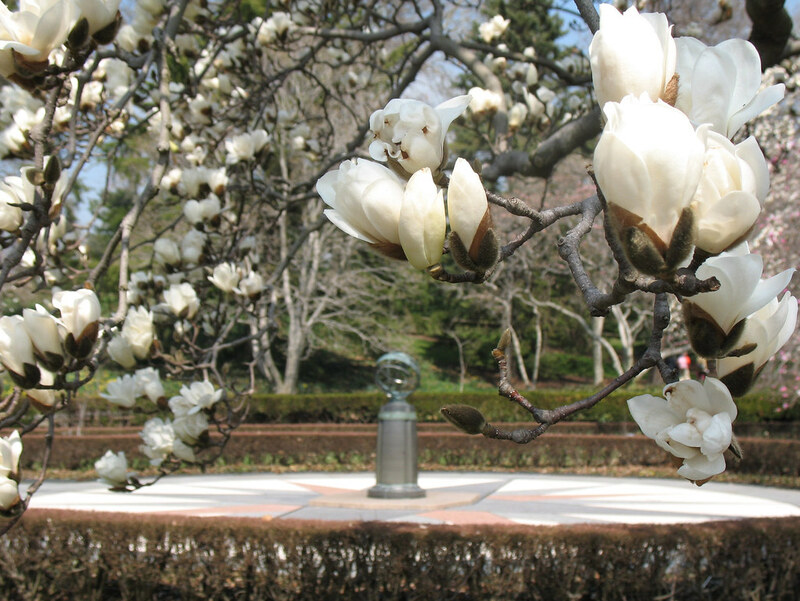 Magnolias, cherry blossoms, lilacs and more dot the Garden in early spring. Here are some of the highlights. The pink, white, and yellow blossoms of Magnolia Plaza are spectacular in the spring. Some trees are also living pieces of BBG’s history, having been developed in the Garden’s breeding program. The earliest trees usually start to bloom in late March, and the rest of the collection follows in April. Early-blooming, “naked” yulan magnolias. These trees are precocious bloomers, which means flowers appear before the leaves. The creamy blooms are among the first to appear, in late March. Saucer magnolias. These popular hybrid magnolias produce gorgeous pink and white blossoms on bare branches (they're also precocious bloomers), some as large as eight inches in diameter. There are a dozen on Magnolia Plaza, and they bloom around the same time as the yulan. Magnolia ‘Elizabeth’. This pale, yellow-blossomed hybrid, on the grassy hill on the north side of Magnolia Plaza, was the first of the renowned yellow magnolia cultivars bred at BBG. It’s a cross between a yulan magnolia and an American cucumber tree. Also be sure to see Daffodil Hill, next to the plaza on the north side. Get up close and notice the difference in color, size, and shape among the multitude of blossoms. There are dozens of species and cultivars here, representing ten different daffodil divisions. This naturalistic landscape was designed to highlight the beauty of the changing seasons. In early spring, it's one of the best places to see ornamental cherries in their full splendor. They bloom throughout April and often into early May, with each cultivar taking a week or two to progress through its bloom cycle. Weeping higan cherry trees. 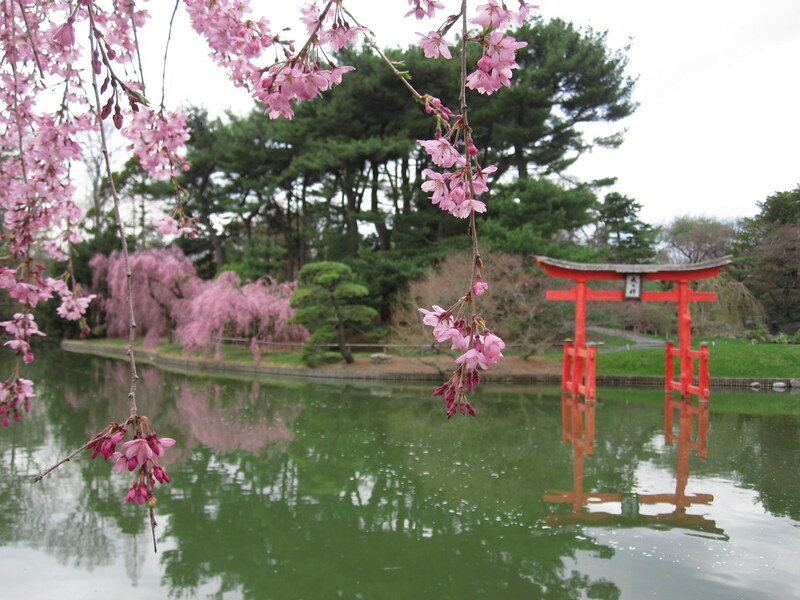 These pink-blossomed trees have gracefully weeping branches and are among the earlier-blooming cultivars at BBG. Single-blossom Yoshino cherries. This ornamental cherry—the most popular in Japan—has flowers that begin as pink buds and open to reveal snowy-white petals. There are several Yoshino trees in the garden, one lovely example just west of the amphitheater, and they bloom in the middle of cherry season, usually in mid-April. Early-blooming azaleas. Among the most common plants seen in Japanese gardens, azaleas—particularly evergreen varieties—provide both structure and spring color. Look for magenta-flowered Kirishima azaleas along the path between the pavilion and the waiting bench and white-blossomed snow azaleas near the shrine. The garden’s designer, Takeo Shiota, created this stroll garden to be both viewed from a distance and explored on foot. Enjoy the individual plants up close and the beautiful spring vistas from different vantage points along the path. 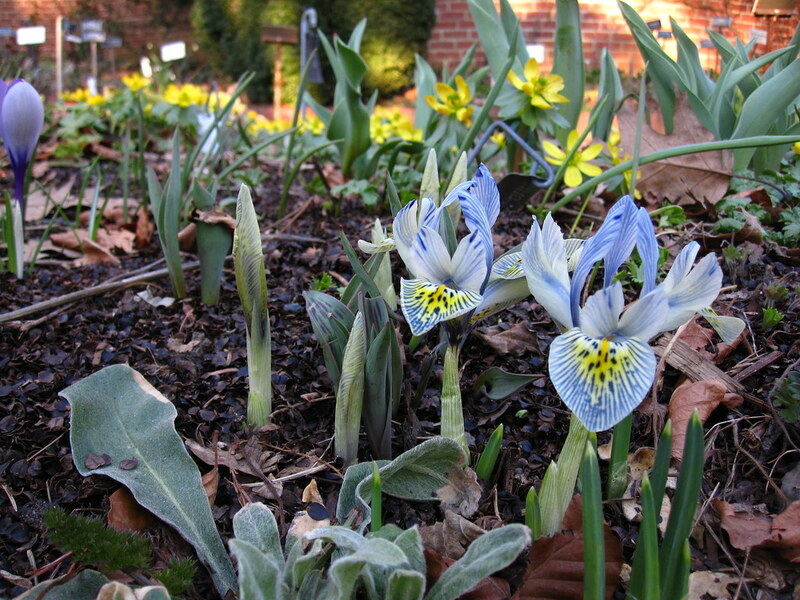 A charming selection of spring blooms from literature, including tulips, primroses, dwarf irises, forget-me-nots, and violets, in the Shakespeare Garden. The spectacular yearly display of tulips and other bulbs in the Annual Border on Lily Pool Terrace. Each year’s design is unique! Crocuses, hellebores, daffodils, anemones, and other low-growing alpine plants, plus many early azaleas, in the Rock Garden. And stay tuned for later spring blooms: peonies, wisteria, crabapples, Spanish bluebells, and more cherries. Magnolia denudata (yulan magnolia) in bloom. Photo by Alison Dorfman. First bloom of Prunus 'Pendula' (weeping higan cherry). Photo by Rebecca Bullene. 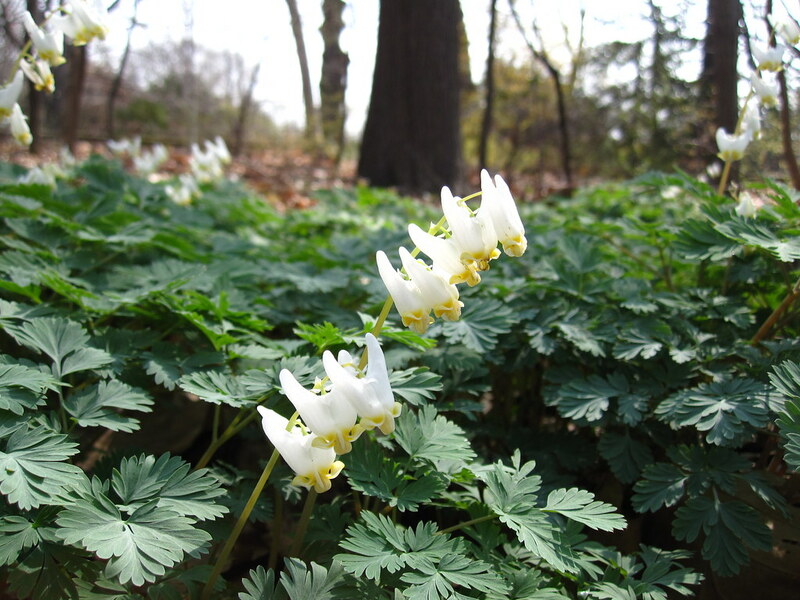 Dicentra cucullaria (Dutchman's breeches) blooms in the Native Flora Garden. Photo by Rebecca Bullene.